Arby’s Classic Roast Beef Sandwiches only $.64 today! You are here: Home / restaurant deals / Arby’s Classic Roast Beef Sandwiches only $.64 today! Arby’s is celebrating their founding in 1964 by offering the Roast Beef Classic sandwich for just $.64 all day today! These are normally close to $3 in my area, so this is an awesome deal! You may want to call ahead to make sure that your location is participating in this promotion. 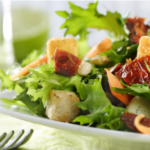 Make sure you click on the link or image above to get your coupon! 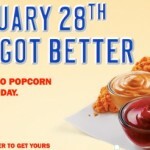 Arby’s: roast beef sandwiches for $.64 tomorrow! Arby’s: Free regular roast beef sandwich + other great offers! 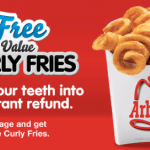 Arby’s: Get free curly fries today! 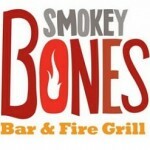 Restaurant Round-up: Smokey Bones, Arby’s + More!